My work trip to Spain started on Wednesday with beginner level dance class followed by advanced. 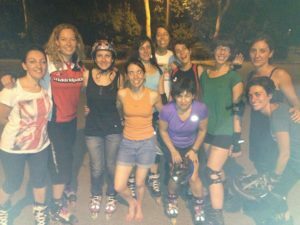 In Madrid, rollerdance (as they call it) is super popular and the skate school MadridPatina always have large classes of enthusiastic students, many of whom I know personally from being here several times and also joining their european city tours (such as Berlin in 2010). MadridPatina work out of the main park El Retiro and there is a huge area dedicated to skating, twice as wide as Serpentine Road and segregated for classes only with bike lanes outside. It’s amazing how easy it is to teach without having to look out for bikes, pedestrians and other skaters. Thursday I met with 10 of MadridPatina’s full time instructors for a 2hr session of instructor development; sharing my ideas on skate technique and answering questions. I love working with this school. We continued in the evening with the same 2 groups of dance classes, putting the finishing touches to long and complicated dance sequences. All students seemed happy and that’s all I care about. Tomorrow the hard work begins; an ICP course level 1 with 17 people. That will be a huge challenge and the forecast is for lots of sun and 30+. I may not have time to report back until monday. Hasta luego!